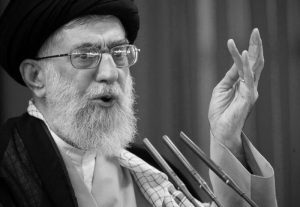 Khamenei speaks to regime followers denying the gravity of the situation and rejecting negotiations with the U.S.
On Monday, August 13th, Iran’s Supreme Leader Ali Khamenei addressed the Iranian people for the first time since the latest wave of protests broke out across the country. In a carefully prepared speech, Khamenei attempted to dispel rumors of pandemic corruption among the regime’s leadership. He also frantically tried to quell calls for regime change. “The government must remain in place to carry out its duties in resolving difficulties with strength”, he said. One striking theme throughout Khamenei’s speech was that he frequently passed the blame for Iran’s precarious economic and political situation onto regime President, Hassan Rouhani. He criticised Rouhani and his government’s lack of preparation for renewed sanctions. Khamenei asserted that “most of the recent economic problems are due to the measures taken within the country. If actions are taken more efficiently, more prudently, more swiftly and more firmly, sanctions cannot have much effect”. He issued an ominous warning that appeared to be directed towards Rouhani’s government. He warned that the judiciary would confront “those who caused the fall in the value of the national currency”. Given the fact that severe economic mismanagement, as well as systematic corruption and the funneling of Iranian finances to foreign terrorist and military groups, caused the plummeting value of the rial, the blame must fall on Rouhani and Khamenei’s own shoulders. Khamenei used his speech to break his silence on the new wave of protests engulfing Iran. He described them as “August incidents” and walked the often-treaded regime line, blaming foreign powers for the domestic unrest. He accused the United States, Israel, and Saudi Arabia of planning “for years to disrupt the country’s security”. He went on to call the protests, “so limited despite the enemies’ huge financial political investments. 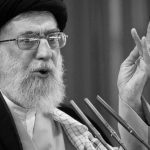 Although his words downplay the significance of the protests, the very fact that Khamenei has broken his long-standing silence on the issue betrays his concern. The protest movement has been intensifying, with protesters chanting “Death to the Dictator”, and “Death to Khamenei”, in a series of protests in Tehran, Karaj, Shiraz, Isfahan, Mashhad, and many other major cities. It is the rising severity of the protests that have forced Khamenei to come out of the shadows and attempt to pacify the protesters. This is evident in his attempt to discredit corruption claims and crush talk of a deadlock within the Iranian regime. However, it was as much about calming the protestors as it was about reassuring the regime’s agents. Khamenei said, “the establishment has already passed through difficult stages and will pass through this one as well”. There were signs of concession from the Supreme Leader in his address. Firstly, he acknowledged his own failings in negotiating the nuclear deal; stating, “what I did was wrong, allowing some officials’ insistence to give a shot at nuclear talks, in which our red lines were not respected”. His second concession came in the form of the economy. Despite trying to shift the blame onto his subordinates, Khamenei did concede that poor policy was a factor in Iran’s economic decline. He said, “the main factor is rooted in our performance”. Khamenei pushed the idea that he would oversee a fight against corruption. However, rather than indicate a genuine desire to tackle graft among regime officials, he is likely to offer up ineffective gestures, as he has done before. During the currency crisis, he had small-time currency dealers arrested. He also removed the director of the Central Bank. But neither action had any impact on corruption in Iran. The worst offenders are within the regime. Corruption is pandemic among the IRGC, the parliament, and among Khamenei, Rouhani, and their associates. Corruption is the lifeblood of the regime. It is the lubricant that keeps the machine running. Any meaningful attempt to eradicate corruption would bring the regime’s government grinding to a halt. Khamenei and the regime are in a deadlock. He must acknowledge that Rouhani’s appalling economic policies have caused the currency decline in which Iran finds itself. Anything less would invoke public outcry. If he passed the blame onto foreign powers, it would prompt the public to push for negotiations with the US. However, at the same time, he cannot lay too much blame at the government’s door. If he did, the people may push for regime change. He attempted to diffuse this situation by acknowledging Rouhani’s role in the economic decline, but simultaneously branding anyone pushing for political change as an enemy of Iran. He said, “those who say the government should be sacked are actually moving in line with enemies’ plots”. He has limited options. The deadlock he finds himself in will only worsen with each new wave of protest. There is no way out for Rouhani, Khamenei, and the entire clerical regime. This ship will not be steadied. It will only sink in the coming waves.